Warm close fitting skull style beanie which is knitted with heather style interwoven acrylic yarns to give a fashionable flecked two tone effect. It is available in one size which will fit most people. Colours: Grey Melange, Charcoal, Red, Blue. Dimension: One size fits most people. Print Description: 100mm x 50mm. Print Type: Embroidery. Packing: Loose packed. 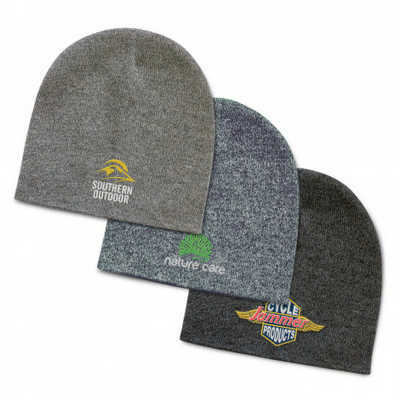 Price includes : Embroidery per position (up to 10,000 stitches). Setup is included.